Seven percent is not that big a number, really. In all likelihood, if your system is hooked up to the grid, then you probably haven’t noticed an appreciable decline in the amount of power you’re producing versus what you’re having to pull from the grid over the time your solar panels have been collecting dirt. That said, seven percent is seven percent. It’s not zero percent. Before you make a decision that involves ladders and hoses and putting yourself more than ten feet above the unforgiving ground, you might consider having a company (maybe your installer) come out and test your current efficiency. If you’ve decided that you can’t live with the idea that you’re not wringing every last watt out of the sky that you can, or have had your system tested and aren’t happy with your current production of electricity, it may be time to break out the ladder. The generally accepted method is to use warm soapy water and a squeegee, much like you’d clean windows. There are also specialty cleaners for solar panels, including some that make special claims of water beading or keeping your panels clean longer through nano-processes and the like. Again, just be sure to apply the “buyer beware” adage and make sure you’re not going to void whatever warranties may apply to your system. Believe it or not, you can also buy a robot, specifically designed to clean your solar panels, that you can set up and forget about. 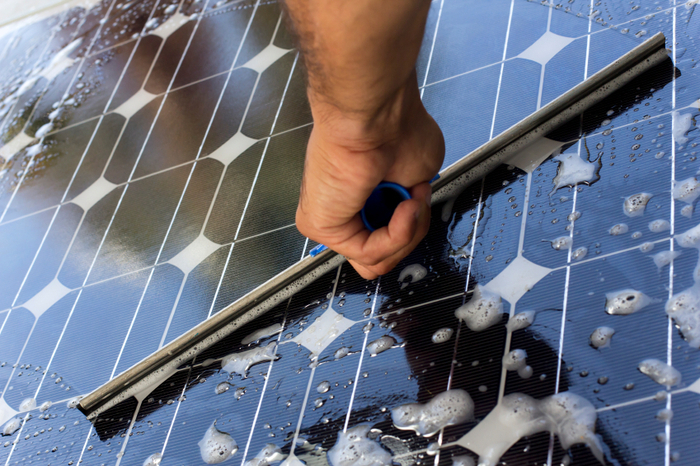 There are also specialized cleaning services for solar panels, and even panels that are “self-cleaning.” If you’re not a DIYer you might select one of these more expensive options when it comes to keeping your panels clean. Regardless of whether you choose to clean your solar panels yourself or employ one of these methods, keep in mind what you’re getting in exchange for what you’re paying for.